Now more than ever, I seek out values wherever and whenever I can. The designer names of the First-Growths and the Napa cult cabernets mean less and less. (Don’t get me wrong: Bring me a bottle of 1987 Spring Mountain Cabernet, and we will talk.) 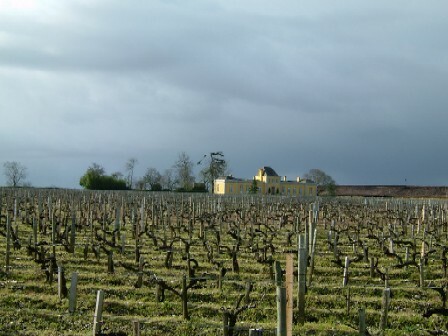 Since the 2005 vintage, I have to agree with Eric Asimov that Bordeaux prices have skyrocketed to such an extent that exploring the better values and, quite frankly, interesting wines from, say, southern Italy and the Beaujolais, seems a wiser move. There is little need anymore to scrounge around the lesser crus on the Gironde estuary. All that said (!!) 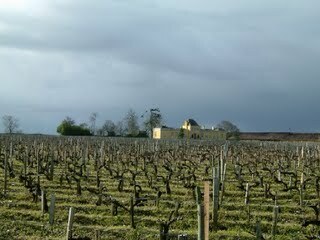 I confess an old-fashioned affinity for Médoc, especially 2005 Chateau Greysac ($13). I love its dark aromas of pencil lead, cherries, blackcurrant and plums, underpinned by austere, but never unappealing, notes of cedar, herbs, tobacco and bell pepper. Here is a wine where the Cabernet Franc does what it was always supposed to do: to etch complexity and nuance onto the folds of velvet fruit that represent a headline vintage like ’05. While this wine would lend itself well to meaty dishes, you already know my penchant for lighter fare. I’d just as easily retire with it to a comfortable chair and nurse it with a good novel, film or diverting after-dinner conversation. If I had to label it, I’d call it my “library” wine. No wonder the British also loved Port. I have a confession to make. Big, bold mouth-staining wines don’t do it for me. So rarely do I eat the food that complements them well: the aged cuts of beef, the savory fatty pork dishes and all that pan-seared caramelized goodness. But give me a lithe and lean pinot noir or a spicy elegant cabernet franc and I’m in heaven. On Friday night, I took a friend for dinner at Momofuku. I hadn’t been there in at least a year, and the food was just as good—or better—than I remember it. And, given their dirt cheap corkage fee, I had a good bottle in tow: a 2001 Fougeray de Beauclair Bonnes-Mares Grand Cru ($105). I figured that a classic year like 2001 would provide an object lesson in what well-made pinot noir can be. Much to my dismay, though, Momofuku does not have stemware. I’ve certainly heard arguments to the contrary, but a good glass does help Burgundy and older Bordeaux. 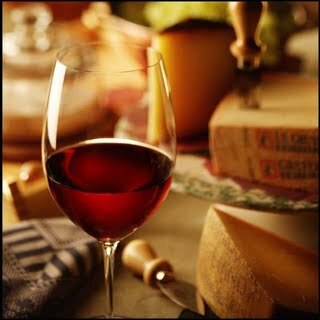 Tumblers are too narrow and deep to allow the wine the proper space to recline, stretch itself out, breathe and warm up. With the door at Noodle Bar opening every thirty seconds, the room was quite cool and our Bonnes-Mares remained chilled throughout the meal. But it showed very nicely next to the steamed pork buns and roasted Hudson Valley foie gras. Deep garnet-purple and medium-bodied and perfectly pleasant to quaff, it all but lacked that iron-fist-in-velvet-glove appeal that should characterize grand cru Burgundy. Noodle Bar is hardly the sort of room where you can relax with your food. It’s more about people-watching and chatting with your tablemates, interspersed with the requisite swoons of “OMG, most delicious thing ever!” Afterward we retired to the hipster-swank Hotel Delmano in Williamsburg for a flight of artisanal rums, while a trio next to us embarked on a most dangerous game of tequila, Tecate and spicy tomato juice. Last night, a wine colleague and I opened a bottle of Michel Gaunoux’s 1999 Beaune ($48). 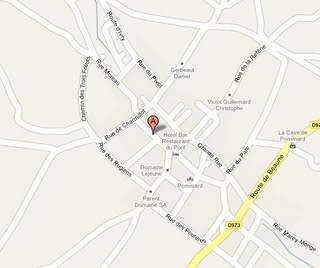 Two steps down the scale from Grand Cru status, this village-level wine was absolutely stunning. Granted, ’99 was a better vintage than ’01, but this wine showed such poise and restraint. It didn’t advertise its superior vintage with fruit-driven oeno-shenanigans. Britons like to refer to “breed” in wine, and I think that term is apropos. Pinot snobs often thumb their noses at Beaune as an appellation that is better known for its whites, but I’ll take its reds any day. The Gaunoux was pure and mineral-driven with silken tannins surrounding a ruby core of crushed red berries, leather, game and a hint of Asian spice (the ground white pepper called prik thai that you’ll find in a Thai specialty store). A little online research revealed that, while this is a village-level wine, it contains grapes from two Premier Cru parcels. I will definitely be snapping up a few more bottles of this at PJ’s for the cellar. Love the thrill of a robust, earthy Burgundy? Have dreams about vintage Champagne? Own a small fortune in fragrance? Think you have an acute sense of smell? 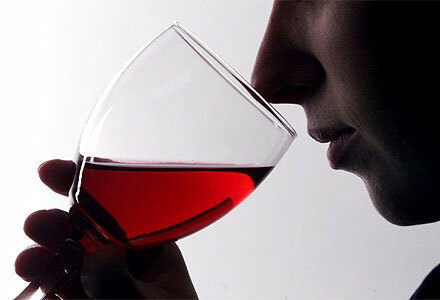 Christopher Voigt, writer and Editor of Vetivresse.com, a WSET®-certified sommelier will lead one 2-hour seminar exploring the shared seduction of wine and perfume on December 15. The seminar will take place in Manhattan and will be limited to 15 participants. We will explore 6 vintage wines from my personal cellar and 6 fragrances, with light hors d’oeuvres and cheese. From the hazelnut splendors of Meursault “Perrières” to the delicate spice of Chinon “Picasses” and the gunflint and fruit of a 1989 Mosel Auslese ... all the way to the pinnacle of honeyed French dessert wines – it is sure to be an evening ripe with revelations for the beginner and seasoned wine lover alike. Two additional seminars will be offered in January. A perfect holiday gift for that busy spouse, friend or loved one who wants to learn more about the world of wine and scent. The cost of the seminar is $150. 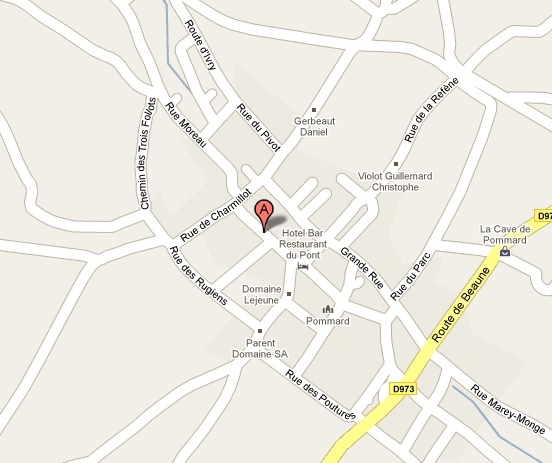 Reservations can be made at vetivresse@gmail.com. Please reply by December 5. Over the weekend a friend and I had a late post-concert supper at the Time Warner location of Landmarc, the pleasantly bustling eatery overlooking Columbus Circle. Neither of us was particularly in the mood for a huge meal, making this the perfect spot to sample some excellent wine and some small portions. One of the things I love about Landmark is that practically every plate is offered as a half-portion. We ordered the pasta of the day––a spaghetti Bolognese––and some boudin noir with pommes frites. As for wine, the 2005 Gaunoux Bourgogne ($46) would compliment both dishes and provide enjoyment throughout the entire meal; except they had just opened their last bottle about a half-hour before we sat down. So I consulted the list again and almost immediately zeroed in on a 2006 Cerasuolo di Vittoria Classico from Azienda Agricola Cos ($48). “Cerasuolo” means “cherry-red” in Sicilian, and indeed it was, with pristine clarity and hue. Even before bringing the glass to my nose, I could assess the weight and rusticity––all those qualities that the rest of the evening would allow it to bring out. The wine had a gorgeous cherry nose and palate, a nice dose of spices and, most importantly, the terroir that I was looking for in my first bottle selection. Still quite youthful and full of luscious berry fruit, its lighter weight appealed and didn’t overpower the casual, simply prepared food. Made from a blend of Nero d’Avola and Frapato grapes (60/40) grown in sandy, tufa-rich soil and fermented in stainless steel, Cerasuolo usually doesn’t see new wood. That said, if deep, rich, high-alcohol oaky reds are your thing, this won’t do the trick. But for me it’s got just the right dose of old world charm. While some vintages can be cellared for a decade or more, the vast majority of bottles are intended for enjoyment in the short term. I love all three iterations of Dior’s Fahrenheit. It is one of those pitch-perfect mainstream fragrances (like Grey Flannel) that never bores this nose. Violet leaf here achieves its most aromatic accord with a host of floral notes that run the gamut from gravelly hawthorn to a green almost-sugary honeysuckle. In its latest flanker, Fahrenheit Absolute, the florals are subdued while the base is amped up. As Octavian Coifan notes on 1000Fragrances, “Not the top notes and the freshness of Fahrenheit were accentuated, but the deepest dark notes.” If the original Fahrenheit were all the petrol-laden flint and florals of a fine Mosel Riesling, the Absolute version is that idea translated to the inside of a toasted barrel and left there for a long, long time. Fahrenheit Absolute has the sweetness of spirits--sweetness that gets you in the back of your throat right after the burn subsides. Think Armagnac-Ténarèze, a newish Hine Cognac, a sherry-cask single-malt Scotch whisky or a very unabashed Reposado. My only gripe: I wish the leather note lasted longer. An hour-and-a-half is all it takes before the incense and guaiac are more apparent. Ah, give me the pencil shavings-and-leather of Montale Aoud Leather. All that said, this is one kitchen that’s too hot for the likes of me. A great winter ’09/10 men’s offering. I hope it comes to the States soon. Image credit: Francois Truffaut, Fahrenheit 451, 35mm film still. Looking back over the F/W 2009 menswear collections on Men.Style.com occasioned some thoughts on which fragrances guys should consider exploring in the months to come. It is, after all, so true that most men just wear what they’ve been wearing – but how to reconcile that with the new direction that their styling of themselves is taking them? Up until now, I saw three main camps: the thrifts (guys who basically won’t consider spending over $45 on fragrance or whose idea of fragrance is their deodorant stick); the jocks (for whom everything in cool blue glass was acceptable, as long as it didn’t clash with the free gel at the gym); and, finally, the traditionalists (Dad wore it, so I wear it). I’m leaving out the hipsters and the stylist types, as their impact on the overall market has been negligible. Each of these camps was a microcosm, insular and often impenetrable. That has all changed. Guys are taking stock of their lives and making an honest assessment of who they are and who they aren’t – they’re choosing to wear things in a new way, one that blends innovation with the things they’ve always felt comfortable in. It’s ultimately about individuality. It’s about taking that old, time-softened flannel shirt and mashing it up with a chunky cardigan and a black silk tie, classic Levi’s and suede moccasins. It’s about grabbing a leather duffel or Filson instead of a clunky black laptop bag. It seems very much like a dressed-up rusticity. It reminds me of what colognes like Polo used to represent. Woods, resins and green-leathers are the rising stars of men’s fragrance notes in Fall 2009 – woods that remind us of the casks used for aging deep, full-bodied red wines and spirits like bourbon and rye. The oud craze will impact this a little, with perfumers looking back at ahead-of-their-time creations, like Yves Saint Laurent’s M7 (from the louche Tom Ford years) and Zirh Ikon. The difference will be that the really successful new scents will ally rusticity with cleanliness. (Aside here: I abhor the fragrance connoisseurs who see gameyness as the sign of profundity. Skatol does not a great fragrance make.) Tom Ford’s Private Blend scents such as Oud Wood, Bois Rouge, Tuscan Leather and Arabian Wood, get this down pat. The truly successful scents will also last on the skin and, while their linear nature may not win them the critics, their drydowns will beguile. What will I be wearing this fall? First off, Creed’s Epicea (whose pine and spice makes me feel like I’ve returned to the original world of Polo, without the teenage prep school angst), Nasomatto’s Black Afgano (which will be splashed on scarves and bulky woolens), Montale’s Aoud Leather (pared-down perfection, so different than everything else in that behemoth collection) and Amouage Epic for Men (I’ve died and either woken up on the set of Lawrence of Arabia or the trapeze in Lola Montès). What’s definitely out? Flowers for men (that’s so 2007). Big ostentatious incenses (God is dead). One-note aquatics (if you want water, book some tickets to the Bahamas). So fill your flasks, guys, grab your copy of Walden, Schott’s Miscellany and a Moleskin or two and start marching to your own beat. I assure you, you won’t be alone. 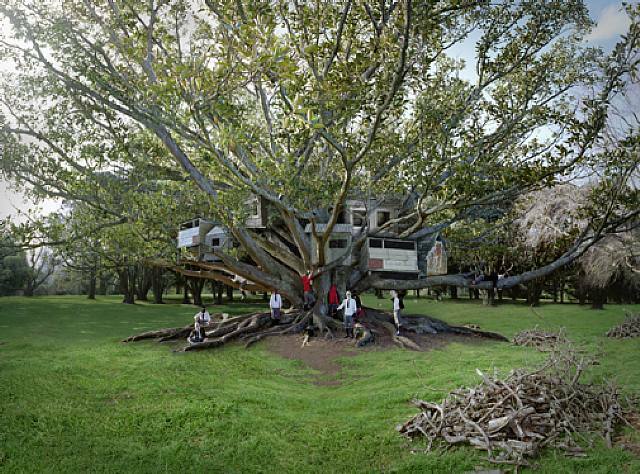 Image credit: Anthony Goicolea, Treedwellers (2004). Courtesy of Torch Gallery, Artworld Online. I recently had the opportunity to experience the fruit of Bond No. 9’s collaboration with the venerable Harrods Knightsbridge department store — what is being called Harrods Special Edition. For those of you who haven’t been following these developments, it’s one of three scents that Harrods commissioned and, notably, it’s the oud among them. 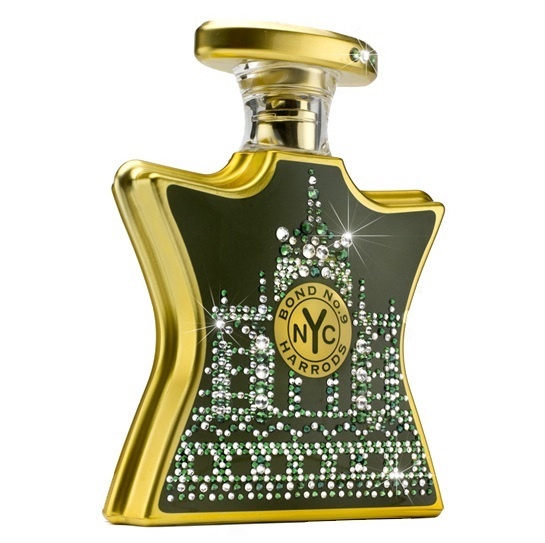 The catch is that it’s a limited-edition scent and its bottle is crystallized with over a thousand Swarovski crystals that I thought we’d already had quite enough of. It’s also pricey. But it’s oud, silly. Joy Land, the intrepid doyenne of Sherry-Lehmann Wine and Spirits, once confided to me that, here in New York, the moneyed families often would buy up all the imperfect labels (the ripped and wine-splashed, etc) — after all, they were just going to drink the stuff, not genuflect in front of it. And, of late, I wish that the same could be done for perfume. Especially, um, Special Edition. A few missing crystals aren’t going to shake what is now bordering on outright adoration. That said, of late my love affair with oud has taken a new turn. 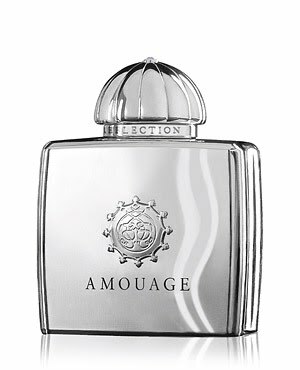 Or, let me rephrase: My love affair with oud’s influence on a select set of Western perfumers — including Christopher Chong’s latest incarnation of Amouage — has just kicked into warp. Seriously, mes amis, last spring I went out on a limb praising the various mukhullats and attars that utilized this strange and precious substance, and lo and behold, here in August 2009, everything’s coming up “oud.” I’m surprised Axe hasn’t come out with an Abu Dhabi-exclusive yet. Apparently, having tested Special Edition and its high-end stablemate By Kilian Pure Oud, I’m struck by the similarity in the base material. It’s been rumored that both employ a new natural ingredient developed by Givaudan called Oud Orpur — and I’d wager that Tom Ford’s Private Blend Oud Wood employs the same, albeit at a greater dilution. It is sheer perfection in a material, and I envy the perfumer who gets the creative brief to use it. Harrods Special Edition opens with cumin and black pepper before exploding on the skin in typical oud fashion and, again, like the By Kilian Pure Oud, tempering it with vetiver. Being much smoother and refined, it’s worlds — galaxies, universes — apart from the rapidly multiplying and (still-affordable-on-a-living-wage) ouds from Montale in Paris. An hour after I sprayed it in the crook of my right elbow, people were asking me what I was wearing and telling me how amazing I smelled. 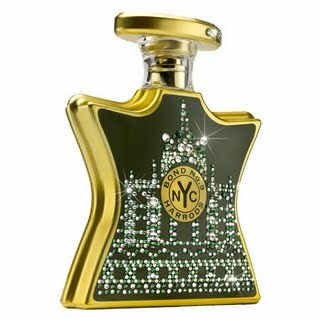 It was one of those “yesss” moments for a perfume connoisseur — as these were normal on-the-go New Yorkers who love to smell good but who don’t particularly fetishisize scent the way that I do. So... I am seriously in love with this juice, just sans those Swarovskis. This side of the Emirates, lavish most certainly does not have to be garish. I detest pretense in perfume. It clouds the judgment. By Kilian, for instance, makes beautiful juice but the creative and marketing pain me. Le Labo has a handful of things I admire and wear, but the tone of the brand is so bloody holier-than-thou. The former is like an interior decoration job that is filled with things that serve no purpose other than ornament; the latter reminds me, in my less ingenuous moments, of a trendy bar washroom that’s been made to look like it dates from 1950; when, in truth, it dates from last Tuesday. Revulsion is a great marketing tool. 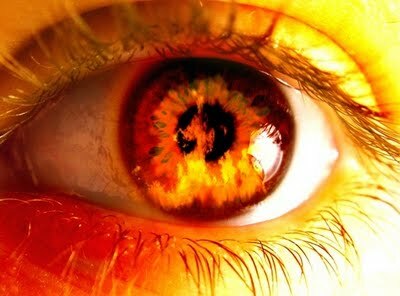 Aside from sensation and intrigue, we really do secretly become fascinated with the things that turn us off. With bad taste, ugliness and vice. After all, a pinch of one of these or other is what turns run-of-the-mill beauty into something addictive. When I first smelled Oud 27, perfumer Dawn Spencer Hurwitz and I looked at each other and mouthed “laundry bag.” (In all fairness, it was a warm May day; I’d smelled at least 40 different fragrances in the four hours preceding.) But something happened over the next ten days -- call it a strong Scent Memory -- that sent me back to Elizabeth Street holding my wallet in hand. It was like tasting black licorice as a child for the very first time, or those nasty black pellets sold in gas stations along the Autostrada that blend anise with Pirelli tire rubber. Unwittingly, a taste had been acquired. I was in love with an oud I could afford. 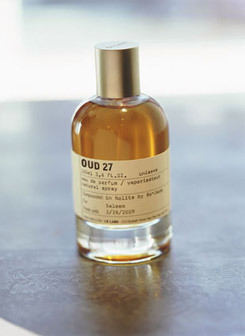 Oud 27 is all about that place between the sweet-savoury and the medicinal. 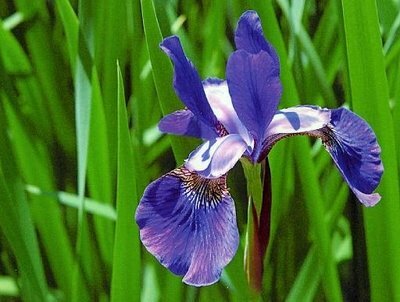 In that sense, it occupies ground held by things like saffron and myrrh. But, allied to this dichotomy, is a hefty dose of castoreum and synthetic civet as well as a sappy woody note (birch oil). The oud used is most likely Oud Synthetic 10760 E by Firmenich. The drydown is Atlas cedar and musk. As with many natural ouds the sweetness can stray into the putrefactory, but the nose here is diverted from that path by a beautiful succession of ancillary notes: including honey, rose, labdanum, and gaiac wood. While many will want to call this unisex, I safely can aver that this belongs on the male of the species, preferably dried on a favorite t-shirt. There is nothing pretentious about it. But, then again, on a humid summer day it’s not exactly courtly love that we’re after. In the world of perfume there are two poles – nostalgia on the one hand, and on the other a kind of reckless novelty. Nostalgia says “It Was and Ever Shall Be.” Reckless Novelty pipes “We’ll Add New Accord and They Will Grow Addicted.” Being a firm believer that you can have too much of a good thing, I try to not to side with either. A conversation that at forty-five minutes long was going to be put into your short book of Greatest Conversations became insufferable at one-hour thirty minutes. It is the same way with great perfumes. Nahéma parfum on a special evening out at the opera was divine; Nahéma Eau de Toilette sprayed on before the school pageant (and reapplied at intermission) is diabolical. On the other end of the spectrum, there is the sometimes-goodhearted attempt to improve on something deemed “old-ladyish,” viz. Mitsouko Fleur de Lotus, Shalimar Eau Légère and other latter-day flankers of Great Perfumes of Days Long Gone. I see nothing morally reprehensible about wanting to contemporize. Well .... with one exception. 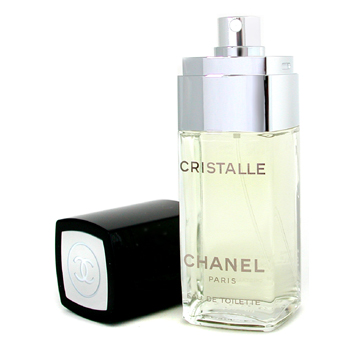 Chanel Cristalle Eau de Toilette is, for me, one of the top 8 fragrances still in production. It is hard as heck to find – not to toot my horn, but Bloomingdale’s still carries it – and recently was flanked by something insipid and green called Eau Verte. It’s been around since 1974, one of the handful of masterpieces of Henri Robert. (No 19 and Pour Monsieur are its stable mates.) It straddles that shaded path between chypre and green floral, and is the quintessential warm-weather scent. Hyacinth, jasmine and melon are fronted by crisp, light citrus and green galbanum. It is youthful and full of irrepressible exuberance without (thanks to oakmoss) ever coming across as cheap or giggly. I grow worried that I don’t see testers out for it anymore – one has to ask for it, and even then the sales associates push the newer Eau de Parfum version (yes, version, not concentration - totally different fragrances). Why? Is Chanel embarassed by some of the scents in its stable? Will No. 19 fall victim to this sort of treatment soon? Each day, my desk fills with three or four new scents for which there is nothing really new to say (or smell) except a shuffling of a few popular aroma chemicals. The vast majority strike me as old before they’re even released onto the market; a few stand out. This isn’t snobbery, it’s just a humbling reminder that precious few things are new under the sun (ever). In a sea of the static, the dynamic must swim against the tide. Cristalle did that. Thirty-five years ago, to be exact.